Historically known for the production of salt, Halstatt's fine architecture reflects the small village's salt mining legacy. Kick off your visit on the 6th (Wed): let little ones run wild at Obertraun Bathing Area/Lakeside Recreation Area and then identify plant and animal life at Langbathseen. To see other places to visit, maps, ratings, and other tourist information, go to the Hallstatt day trip app . Budapest, Hungary to Hallstatt is an approximately 5.5-hour car ride. You can also take a shuttle; or take a train. Finish your sightseeing early on the 7th (Thu) to allow enough time to drive to Innsbruck. 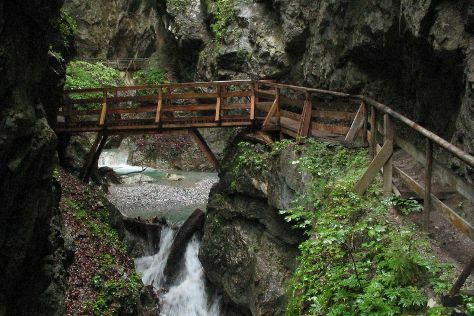 Kick off your visit on the 8th (Fri): trek along Wolfsklamm Gorge, get to know the fascinating history of Rattenberg - Medieval pedestrian zone, and then tour the pleasant surroundings at Gaisalm. To find reviews, ratings, and tourist information, go to the Innsbruck trip planner. Drive from Hallstatt to Innsbruck in 3 hours. Alternatively, you can take a bus; or take a train. In June, plan for daily highs up to 28°C, and evening lows to 14°C. Wrap up your sightseeing by early afternoon on the 9th (Sat) to allow time for the car ride to Merano. Merano or Meran is a town and comune in South Tyrol, northern Italy. Start off your visit on the 9th (Sat): examine the collection at Castello Rametz - Wine Museum and then take in the waterfront at Passeggiata D'inverno. To find other places to visit, where to stay, and tourist information, you can read our Merano sightseeing tool . Drive from Innsbruck to Merano in 2 hours. Alternatively, you can take a bus; or take a train. Traveling from Innsbruck in June, expect Merano to be somewhat warmer, temps between 34°C and 18°C. On the 10th (Sun), wrap the sightseeing up by early afternoon so you can drive to Cortina d'Ampezzo. Cortina d'Ampezzo, commonly referred to as Cortina, is a town and comune in the heart of the southern (Dolomitic) Alps in the Veneto region of Northern Italy. On the 10th (Sun), contemplate the waterfront views at Lago d'Antorno and then fly down the slopes at Lagazuoi. To find reviews, where to stay, more things to do, and other tourist information, you can read our Cortina d'Ampezzo online trip maker . You can drive from Merano to Cortina d'Ampezzo in 2.5 hours. Other options are to do a combination of train and bus; or take a bus. In June, daily temperatures in Cortina d'Ampezzo can reach 34°C, while at night they dip to 18°C. Finish up your sightseeing early on the 11th (Mon) so you can go by car to Garda. To find photos, where to stay, reviews, and other tourist information, you can read our Garda day trip planning app . Getting from Cortina d'Ampezzo to Garda by car takes about 3 hours. Other options: take a bus; or do a combination of train and bus. In June, plan for daily highs up to 33°C, and evening lows to 20°C. You will leave for Venice on the 12th (Tue). On the 12th (Tue), contemplate the waterfront views at Canal Grande, wander the streets of Cannaregio, take in the views from Ponte di Rialto, then pause for some serene contemplation at Basilica di Santa Maria della Salute, then enjoy breathtaking views from St Mark's Campanile, and finally explore the galleries of Doge's Palace. To see reviews, where to stay, more things to do, and other tourist information, go to the Venice route planning tool . You can drive from Garda to Venice in 2 hours. Other options are to do a combination of bus and train; or take a bus. June in Venice sees daily highs of 32°C and lows of 20°C at night. Wrap up your sightseeing on the 12th (Tue) to allow time to drive to Bled. Start off your visit on the 13th (Wed): identify plant and animal life at Straza Bled and then glide through the air with a parasailing or paragliding tour. To find reviews, traveler tips, photos, and tourist information, go to the Bled trip itinerary tool . Traveling by car from Venice to Bled takes 3 hours. Alternatively, you can take a shuttle; or take a train. Expect little chillier evenings in Bled when traveling from Venice in June, with lows around 14°C. Finish your sightseeing early on the 13th (Wed) to allow enough time to drive back home.